The acquisition of data for cardiac imaging using a C-arm CT system requires several seconds and multiple heartbeats. Hence, incorporation of motion correction in the reconstruction step may improve the resulting image quality. Cardiac motion can be estimated by deformable 3-D/3-D registration performed on initial 3-D images of different heart phases. This motion information can be used for a motion-compensated reconstruction allowing the use of all acquired data for image reconstruction. 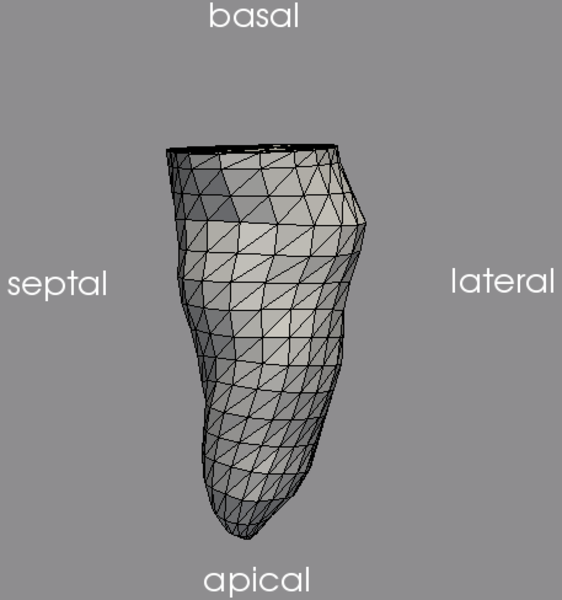 However, the result of the registration procedure and hence the estimated deformations are influenced by the quality of the initial 3-D images. In this paper, the sensitivity of the 3-D/3-D registration step to the image quality of the initial images is studied. Different reconstruction algorithms are evaluated for a recently proposed cardiac C-arm CT acquisition protocol. The initial 3-D images are all based on retrospective electrocardiogram (ECG)-gated data. ECG-gating of data from a single C-arm rotation provides only a few projections per heart phase for image reconstruction. This view sparsity leads to prominent streak artefacts and a poor signal to noise ratio. Five different initial image reconstructions are evaluated: (1) cone beam filtered-backprojection (FDK), (2) cone beam filtered-backprojection and an additional bilateral filter (FFDK), (3) removal of the shadow of dense objects (catheter, pacing electrode, etc.) before reconstruction with a cone beam filtered-backprojection (cathFDK), (4) removal of the shadow of dense objects before reconstruction with a cone beam filtered-backprojection and a bilateral filter (cathFFDK). The last method (5) is an iterative few-view reconstruction (FV), the prior image constrained compressed sensing (PICCS) combined with the improved total variation (iTV) algorithm. All reconstructions are investigated with respect to the final motion-compensated reconstruction quality. The algorithms were tested on a mathematical phantom data set with and without a catheter and on two porcine models using qualitative and quantitative measures. The quantitative results of the phantom experiments show that if no dense object is present within the scan field of view, the quality of the FDK initial images is sufficient for motion estimation via 3-D/3-D registration. When a catheter or pacing electrode is present, the shadow of these objects needs to be removed before the initial image reconstruction. An additional bilateral filter shows no major improvement with respect to the final motion-compensated reconstruction quality. The results with respect to image quality of the cathFDK, cathFFDK and FV images are comparable. As conclusion, in terms of computational complexity, the algorithm of choice is the cathFDK algorithm. Figure: Multiple motion-compensated reconstructions (cathFDK-MC) of a porcine model. Today, quantitative analysis of 3-D dynamics of the left ventricle (LV) cannot be performed directly in the catheter lab using a current angiographic C-arm system, which is the workhorse imaging modality for cardiac interventions. Therefore, myocardial wall analysis is completely based on the 2-D angiographic images or pre-interventional 3-D/4-D imaging. In this paper, we present a complete framework to study the ventricular wall motion in 4-D (3-D+t) directly in the catheter lab. 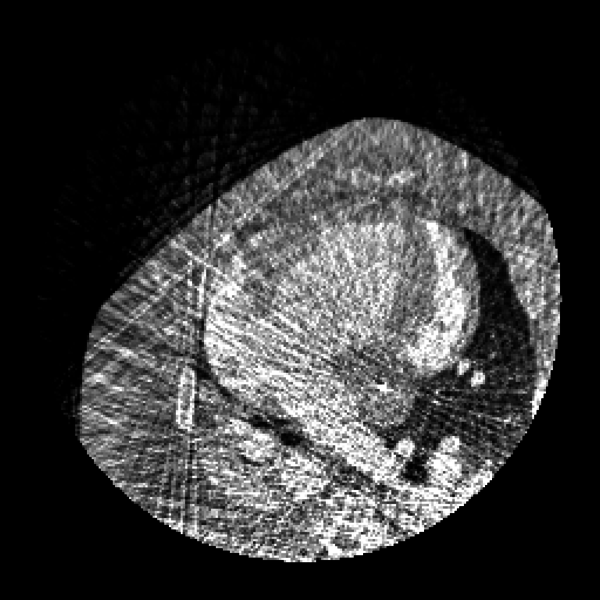 From the acquired 2-D projection images, a dynamic 3-D surface model of the LV is generated, which is then used to detect ventricular dyssynchrony. Different quantitative features to evaluate LV dynamics known from other modalities (ultrasound, MR) are transferred to the C-arm CT data. We use the ejection fraction (EF), the systolic dyssynchrony index (SDI), a 3-D fractional shortening and the phase to maximal contraction to determine an indicator of LV dyssynchrony and to discriminate regionally pathological from normal myocardium. The proposed analysis tool was evaluated on simulated phantom LV data with and without pathological wall dysfunctions. The used LV data is publicly available online at conrad.stanford.edu/data/heart. In addition, the presented framework was tested on eight clinical patient data sets. The first clinical results demonstrate promising performance of the proposed analysis tool and encourage the application of the presented framework to a larger study in clinical practice. Figure: Colour overlay of the three-dimensional fractional shortening onto a left ventricular surface mesh. In interventional cardiology three-dimensional anatomical and functional information of the cardiac chambers, e.g. the left ventricle, would have an important impact on diagnosis and therapy. With the technology of C-arm CT it is possible to reconstruct intraprocedural 3-D images from angiographic projection data. Due to the long acquisition time of several seconds, motion-related artifacts, like blurring or streaks, occur. Therefore, the heart dynamics need to be taken into account in order to improve the reconstruction results. When it comes to the evaluation of different motion estimation and compensation algorithms and techniques of motion analysis there is still a lack of comparability of the final reconstructions and motion parameters between the research groups. Since the results are heavily dependent on the applied motion pattern and simulation parameters, the experiments are not reproducible. 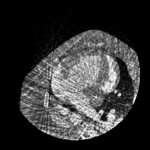 We try to overcome these problems by providing varying left heart ventricle phantom datasets, consisting of projection images as well as extracted surface meshes. Up to now, there are six different datasets available: one with a normal sinus rhythm, one with a normal sinus rhythm and a catheter, one with a lateral wall defect of the ventricle, two with a lateral contraction phase shift and one without any motion. 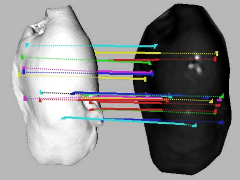 The existing datasets are based on a phantom similar to the 4D XCAT phantom with a contrasted left ventricle, myocardium and aorta. The geometry calibration and acquisition protocol from a real clinical C-arm scanner are used. A webpage is provided where the data and the necessary files are publicly available for download at conrad.stanford.edu/data/heart. A pdf version of the presented poster can be downloaded here. Figure: Example images of the generated phantom datasets. In C-arm CT, electrocardiogram (ECG)-gating of data from a single C-arm rotation provides only a few projections per heart phase for image reconstruction. This view starvation leads to prominent streak artifacts and a poor signal to noise ratio. Motion compensation techniques allow for the use of all acquired data for image reconstruction. Cardiac motion can be estimated by deformable 3-D/3-D registration processed on initial 3-D images of different heart phases. The initial 3-D images are computed from the few, ECG-gated data. In this paper, the sensitivity of the 3-D/3-D registration step to the image quality of the initial images is studied. Different reconstruction algorithms are evaluated for a recently proposed cardiac C-arm CT acquisition protocol. An iterative few-view reconstruction, and a filtered backprojection method (FDK) with and without a bilateral filter are investigated with respect to the final motion compensated reconstruction quality. The algorithms were tested on a phantom and on a porcine model using qualitative and quantitative measures. The phantom projection data and geometry is publicly available and can be downloaded from conrad.stanford.edu/data/heart. The results show minor differences between the three motion compensated reconstructions. For two heart phases a relative root mean square error (rRMSE) of  0.09 and 0.06 and an universal image quality index (UQI) of  0.98 and 0.99 was achieved. The motion compensated reconstructions that use all of the projection images show a clear improvement compared to the initial reconstructions. Given the relatively small differences in final image quality, the algorithm of choice is likely to be the one with smallest computational complexity. Figure: Central slice of the standard FDK reconstruction, the ECG-gated reconstruction (~32 views) and the motion compensated recosntruction F-VRr of a porcine heart. Image courtesy of the Department of Cardiovascular Sciences, University of Leuven, Leuven, Belgium. In interventional cardiology three-dimensional anatomical and functional information of the cardiac chambers would have an important impact on diagnosis and therapy. With the technology of C-arm CT it is possible to reconstruct intraprocedural 3-D images from angiographic projection data. In order to generate accurate and artifact-free reconstructions from dynamic cardiac projections, the motion needs to be taken into account. We present the novel Combined Multiple Heart Phase Registration (CMHPR) method. CMHPR is an iterative motion estimation and compensation algorithm that uses projection data acquired during a single C-arm sweep. Filtered-backprojection (FBP) volumes from electrocardiogram (ECG)-gated data are reconstructed for different motion states of the heart. According to an unknown 4-D motion vector field the ECG-gated FBP images are deformed and accumulated to a sum volume for representing the status of a particular heart phase. In an iterative optimization procedure the 4-D motion vector field is computed by registering the sum volume to a reference volume of the same heart phase. The negative normalized cross correlation (NCC) of both volumes is used as a cost function. In this paper, the reference image is generated using the prior image constrained compressed sensing (PICCS) algorithm combined with the improved total variation (iTV). First preliminary experiments on clinical porcine data sets show promising results. CMHPR reduces streak artifacts and simultaneously preserves sharp edges without producing the artificial comic-like appearance of the PICCS + iTV reference volume. Figure: Central slice of the CMHPR reconstructions of a porcine heart over the heart cycle. Image courtesy of the Department of Cardiovascular Sciences, University of Leuven, Leuven, Belgium. Anatomical and functional information about the cardiac chambers is a key component of future developments in the field of interventional cardiology. With the technology of C-arm CT it is possible to reconstruct intraprocedural 3-D images from angiographic projection data. Some approaches attempt to add the temporal dimension (4-D) by electrocardiogram(ECG)-gating in order to distinguish physical states of the heart.However, for the left heart ventricle scanned during one single C-arm sweep, this approach leads to insufficient projection data and thus to a degraded image reconstruction quality. 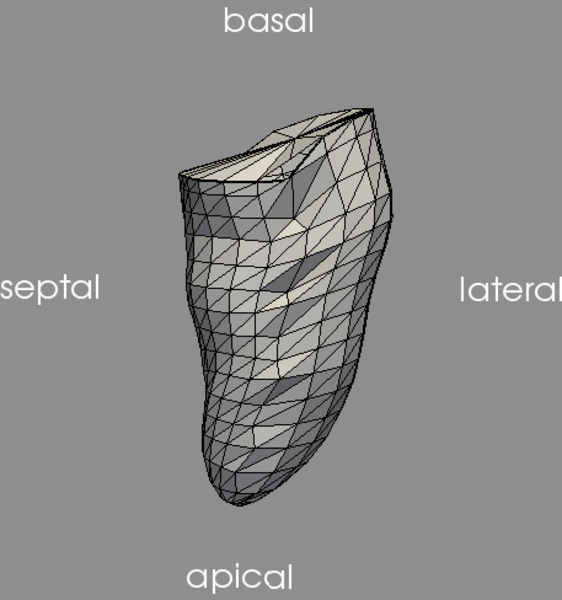 In this paper, we evaluate the influence of different interpolation methods for a motion compensated reconstruction approach for the left heart ventricle based on a recently presented 3-D dynamic surface model. 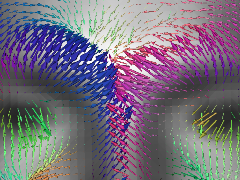 The surface model results in a sparse motion vector field (MVF) defined at control points. However, to perform a motion compensated reconstruction a dense MVF is required.The dense MVF can be determined by different interpolation methods. In this paper, we evaluate thin-plate splines (TPS), the Shepard’s method, simple averaging, and a smoothed weighting function as interpolation functions. The 2-D overlap of the forward projected motion compensated reconstructed ventricle and the segmented 2-D ventricle blood pool is quantitatively measured with the Dice similarity coefficient and the mean deviation between extracted ventricle contours. Preliminary results on heart ventricle phantom data, as well as on clinical human data show the best results with the TPS interpolation. Figure: Motion compensated reconstructions of a porcine left heart ventricle with the TPS over the heart cycle. Image courtesy of the Fahrig Lab, RSL, Department of Radiology, Stanford University. 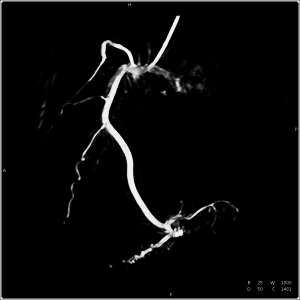 Generating 3-D reconstructions of cardiac vasculature from angiographic C-arm CT (rotational angiography) data is a challenging problem. Currently, many approaches depend on a reconstruction from ECG-gated projection data either as a reference for further processing or as the final result. Due to imperfect gating, e.g. caused by irregular heart movement, residual motion corrupts these reconstructions. We present an algorithm to compensate for this residual motion. The approach is based on a deformable 2-D–2-D registration between the acquired projection data and a forward projection of the initial ECG-gated reconstruction. It does not depend on an explicit segmentation of vasculature or markers, and works without user interaction. The estimated 2-D deformation field is compensated for in the backprojection step of a subsequent reconstruction. The algorithm is evaluated on six clinical datasets, showing a clear decrease in artefact level and better visibility of structure in the compensated reconstructions. Figure: Reconstruction result after two iterations of the proposed algorithm. 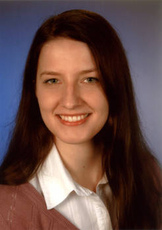 Image courtesy of Prof. Dr. D. Böcker and Dr. P. Skurzewski, St. Marienhospital Hamm, Germany. The real time X-ray angiography based on C-arm cone beam system is the workhorse imaging modality for interventional cardiac procedures. These images are two-dimensional (2D) projections of three dimensional (3D) objects along the X-ray direction. 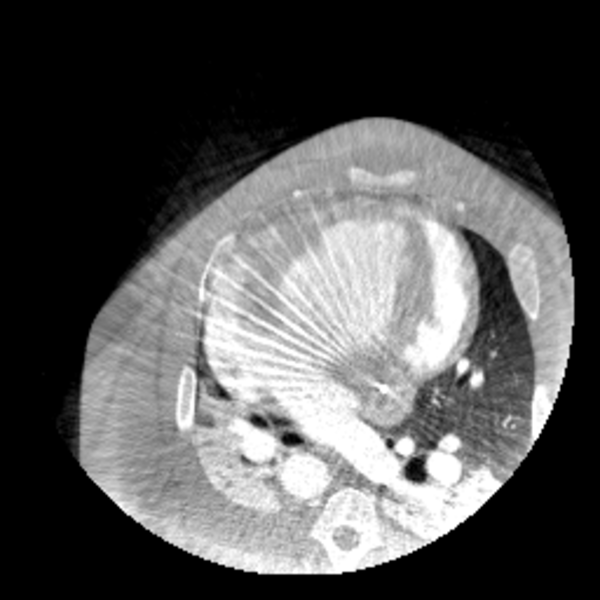 The organ of interest (OOI), such as left ventricle(LV) endocardium, in the projection image is superimposed with other anatomical structures and often has low contrast. In this study, a novel approach is proposed to isolate the OOI in projection images by subtracting with a background image, which is generated by numerical projection of 3D tomographic image with OOI masked out. Study based on one patient and one pig image is taken. About two to three-fold increase in the contrast-to-noise ratio (CNR) is achieved for LV endocardium, compared to an unprocessed image. ew projections). The extracted dynamic model provides quantitative cardiac function analysis and an overlay of the model onto 2D real-time fluoroscopic images provides valuable visual guidance during cardiac interventions. 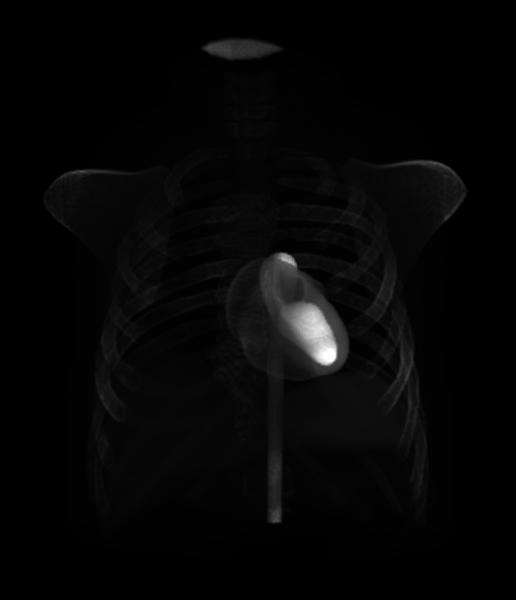 An initial static LV model is extracted from an ungated C-arm CT reconstruction. This initialized model in then projected onto each 2D projection image. The silhouette of the projected mesh is deformed to match the boundary of the LV blood pool. The deformation vectors of the silhouette are back-projected to 3D and used as anchor points tor thin-plate spline (TPS) interpolation of other mesh points.The extracted 3D LV meshes match the ground truth quite precise with a mean point-to-mesh error of 0.51 +/- 0.11 mm. The preliminary experiments on two real datasets (included a patient and a pig) show promising results. Figure: Forward projection of the 3D dynamic mesh onto the pig projection data. 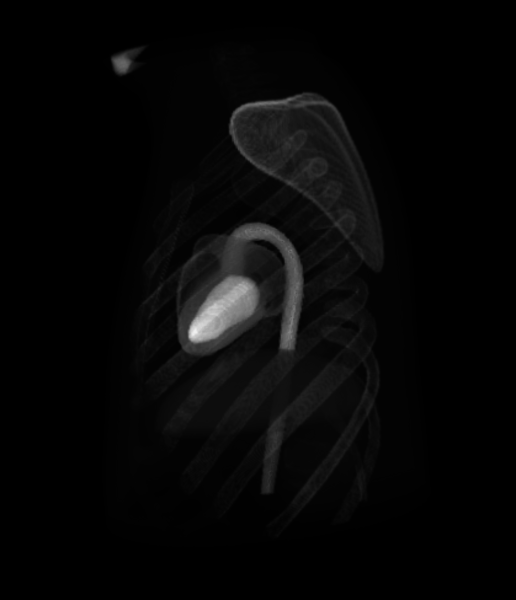 Image courtesy of the Fahrig Lab, RSL, Department of Radiology, Stanford University.